Hot melt adhesive TEX YEAR® is an eco-friendly solid adhesive that is safe, non-toxic, and fast-curing. 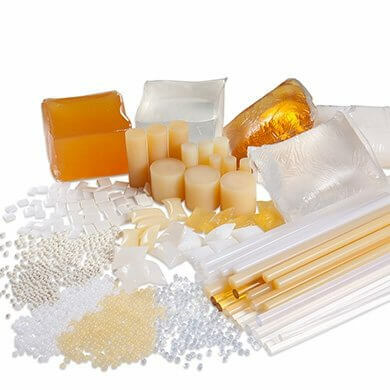 Completely in compliance with RoHS, REACH and other green product certifications, Hot melt adhesive TEX YEAR® is suitable for all kinds of manual/automated production operations. TEX YEAR adhesive consultants and R&D groups are here to meet all of your adhesive needs. ◎ EVA hot-melt adhesive series: ethylene-vinyl acetate copolymer. ◎ TPR / Rubber hot-melt adhesive series: with surface tack, these are also known as pressure-sensitive hot-melt adhesives or pressure-sensitive adhesive. ◎ APAO / Polyolefin hot-melt adhesive series: polyolefin hot-melt adhesive. ◎ Polyamide hot-melt adhesive series: polyamide hot-melt adhesive. ◎ MPO metallocene hot-melt adhesive series: these have the best thermal stability of all hot melt adhesives. General Hot-Melt Adhesives are mostly EVA-based, which is suitable for rapid automatic manufacturing processes without special adhesive requirements. With an absolute price advantage, the EVA-based hot-melt adhesives are the most common type on the market. Product applications include FDA-grade beverage and food packaging, bookbinding, footwear, woodworking , toys, accessories, industrial assembly, DIY products, air filters, NSF-grade drinking water filters, and the automobile industry. With surface tack, pressure-sensitive hot-melt adhesives are mostly TPR / Rubber-based, which is suitable for lamination and coated adhesion at room temperature. Product applications include tapes, labels, hygiene materials, household supplies, packaging, automobiles, industrial assembly, and footwear. ◎ APAO / Polyolefin hot-melt adhesives are highly resistant to high temperatures and low temperatures with great adhesion for low polarity materials. ◎ Polyamide hot-melt adhesives are highly resistant to high temperatures. ◎ MPO metallocene hot-melt adhesives are nearly odorless and have the best thermal stability of all hot melt adhesives. Product applications include laminated packaging, straw attachment , hygiene material lamination, furniture assembly, electrical assembly, the filter industry, the electronic/mechanical industry, footwear, household sanitary products (insect trap / rat glue board), etc. Hot-melt glue gun is a handy tool for manual operations. Suitable for manufacturing, household repairs & maintenance, and DIY projects.Hot-melt glue gun is an indispensable tool for families, schools, and factories. Tex Year provides hot-melt glue guns with stable quality that are completely manufactured in Taiwan. PTC ceramic heater is equipped to facilitate fast rising temperatures and deliver glue efficiently. The temperature of the hot-melt glue gun nozzle can reach as high as 170°C to ensure stable glue output. 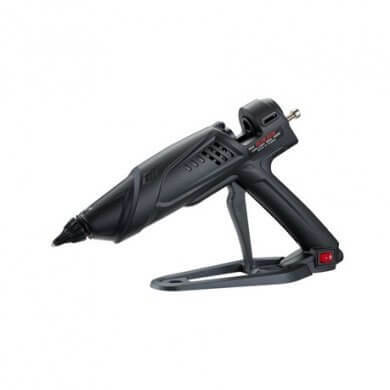 With a burn-proof nozzle, you can feel at ease while using our hot-melt glue gun. We also have a 300W industrial hot-melt glue gun that is especially designed for continuous operation during industrial manufacturing process. Besides larger glue output, the output volume can also be adjusted based on special requirements. An on/off switch is also made available to turn the power on or off as needed, which not only saves the trouble of plugging and unplugging, but also allows an even more efficient manufacturing process. Tex Year also provides glue sticks with a full range of diameters and lengths to meet different requirements for various equipments and manufacturing process.